Our mission is to improve the quality of life of Latinos living in Montgomery County by contributing to the development and implementation of an integrated, coordinated, culturally and linguistically competent health wellness system that supports, values, and respects Latino families and communities. We’re excited to announce the release of our 2018 Annual Report. 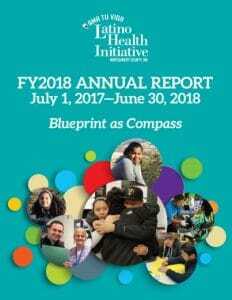 This Annual Report looks back on the programs and service accomplishments that made 2018 a success in our efforts to address the health needs of Latinos (and other underserved communities) in the county. Whether it was the array of our community health programs for children and parents, the work of our Welcome Back Center to assist internationally trained health professional to re-enter the health workforce locally, or our important community partnerships with local and national organizations, we are proud of the impact we made in in the lives of Montgomery County residents in 2018. The following resources are designed for individuals and organizations that work to improve the health and well being of Latino people.